South Bend, Indiana Mayor Pete Buttigieg, for instance, out-raised several well-known Democratic candidates, including Massachusetts Sen. Elizabeth Warren, Minnesota Sen. Amy Klobuchar and New Jersey Sen. Cory Booker, according to an ABC News analysis of candidates' preliminary fundraising numbers from the first quarter of 2019. A new Quinnipiac poll of California voters put Buttigieg in a tie for fourth place with Warren, with each earning 7 percent of the vote. It's early yet, though, so whether Buttigieg's bump in the polls will continue, or if another candidate will edge him out, remains to be seen. The Georgia Democrat continues to hover on the periphery of the 2020 field as she decides whether to run for president or Senate (or neither). When asked during an interview with CNN whether there are too many Democrats running for office, she said, "No, I think that's a false narrative." "The point of a primary is to winnow down the number of people who are actually going to be viewed by the public and go through the fisticuffs of debate," she said. At the close of his remarks, he told the crowd in Washington, "I am convinced, as we make significant progress in cancer, the only truly nonpartisan issue facing the country, that the rest of the nation is going to say, 'Dammit we can do anything. This is the United States of America.'" 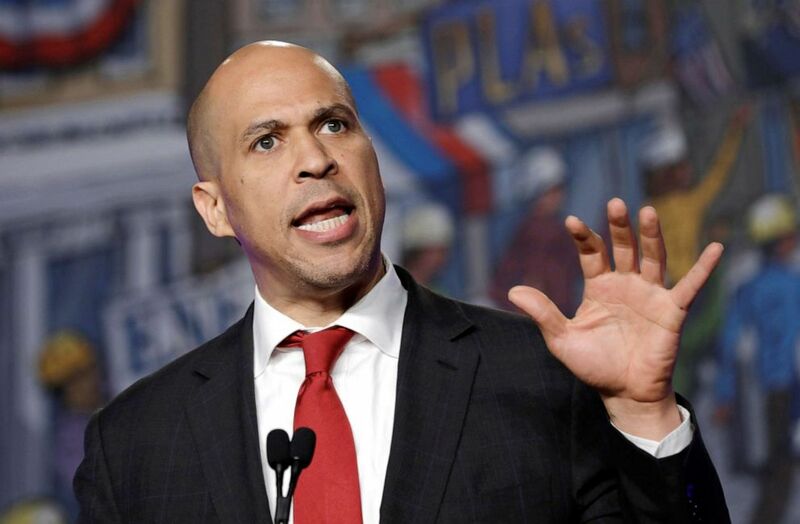 Democratic U.S. presidential candidate Senator Cory Booker speaks at the North America's Building Trades Unions 2019 legislative conference in Washington, U.S., April 10, 2019. Booker, who formally announced his entry into the 2020 race in February, is hosting a hometown official kickoff on Saturday to launch his "Justice for All Tour" that will take him on a two-week trip across the country. At the onset of the week, the New Jersey senator introduced a bill in the U.S. Senate to form a commission to study reparations. Booker told The Root that he "unequivocally supports" reparations for black people. His bill is a companion to HR 40, introduced by Rep. Sheila Jackson Lee in the U.S. House. "If me being gay was a choice, it was a choice that was made far, far above my pay grade," he told a crowd at the LGBTQ Victory Fund National Champagne Brunch. "That's the thing I wish the Mike Pences of the world would understand. That if you got a problem with who I am, your problem is not with me -- your quarrel, sir, is with my creator." Pence's press secretary responded to Buttigieg's comments, writing in a tweet, "The last time we recall Pence even mentioned @PeteButtigieg was in 2015, after news that Pete came out, Pence said: 'I hold Mayor Buttigieg in the highest personal regard. I see him as a dedicated public servant and a patriot.'" In the hours after President Trump touched down in San Antonio for a fundraiser, Castro held an opposing rally in the city, according to the Corpus Christi Caller Times. Admonishing the president's hardline immigration policies, the former San Antonio mayor said: "People in San Antonio understand the value of immigrants. This is a city that has been built up by immigrants, and it's one of the most successful cities in the United States. It's a testament to the power of immigration over the generations." Delaney, one of the first candidates in the field, emphasized his centrist platform on the trail in Pennsylvania to cast himself as a "different kind" of Democrat, according to the The Daily Pennsylvanian. "For a small campaign like ours without a big dollar donor network and a campaign that refuses PAC contributions, we knew we had to rely fully on the power of the people," she said in a video posted on her Twitter account. "We've been blown away." "When I was a member of Congress from upstate New York, I was really focused on the priorities of my district. When I became senator of the entire state, I recognized that some of my views really did need to change," Gillibrand said during a CNN town hall Tuesday. "They were not thoughtful enough and didn't care enough about people outside of the original upstate New York district that I represented. So, I learned." GIllibrand also said in the town hall that Clinton has given her advice about her presidential campaign and is a "role model for all of us." "Hillary Clinton put that 65 million cracks in that highest and hardest glass ceiling. She's inspired the world by her bravery and courage," Gillibrand said. "Secretary Clinton is still a role model for all of us." But despite her admiration for Clinton, Gillibrand said that she believes former President Bill Clinton should have resigned after the Monica Lewinsky scandal. Harris signaled that she's open to an all-female Democratic ticket in 2020, saying in an interview on SiriusXM Progress's Make It Plain, "Wouldn't that be fabulous?" She also made her third trip to Iowa earlier this week -- focusing on the issue of raising teacher pay -- according to her campaign. The former Colorado governor took the stage at the Building Trades Conference in Washington to court the pro-union crowd, urging that the country "needs a president" that supports unions. "I didn't check off how many times I said you're fired," he told the audience, an apparent jab at President Trump. "I said you're hired. … That's why I am running for president." "We are the first generation to feel the sting of climate change, and we are the last generation, literally, who can do something about it," the Washington governor said at a CNN town hall. He also took aim at one key debate playing out across the 2020 field — reforming Senate rules and the filibuster. "We're not going to be able to get health care done, or anything else for that matter, unless we get rid of the filibuster," he said. "If the filibuster is still in Mitch McConnell's hand come 2021, all hope is sort of down the tubes to be able to do real significant reform." Politico reported that the Minnesota senator spoke about her grandfather saving money in a coffee can to send her father to college and her father's struggle with alcoholism later in life. "I saw him sink to the lowest valleys because of his struggles. He got three DWIs, and it was on the third DWI that he finally had to go and get treatment," she said. "Because of his work, because of people that worked with him … just like people work with you, he was pursued by grace, and his life changed." Former Virginia governor Terry McAuliffe speaks at the North America's Building Trades Unions (NABTU) 2019 legislative conference in Washington, April 10, 2019. Former Virginia Gov. 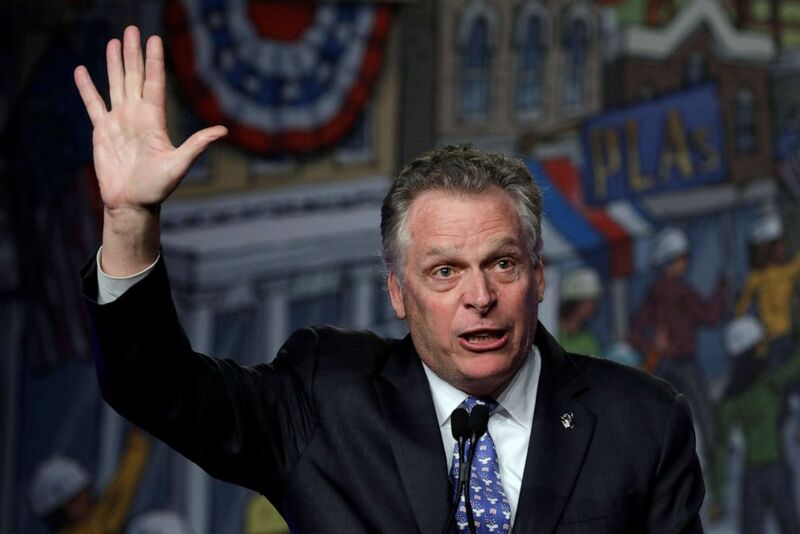 Terry McAuliffe, who is still considering a run for the White House, signaled that he is closer to making a final decision. "I have not made my decision yet. I am very close," he said at the Building Trades Conference in Washington. "If I do decide, I'll make a decision in a couple of weeks." McAuliffe spent most of his speech Wednesday touting his record as governor of Virginia -- before underscoring his willingness to take on Trump. "I think when you're looking for your next president, you have to look at the governors because they are CEOs," he said. "I just want you to remember one thing -- of all the candidates running, how many have actually wrestled a 280-pound, 8-foot alligator for a political contribution for $15,000." "If I can wrestle an alligator, I can sure as hell wrestle Donald Trump," he said. After announcing his long-shot bid for president, Messam traveled to both South Carolina and Nevada, before heading to California on Thursday. The Democratic mayor of Miramar, Florida, kicked off a two-day visit in the state with a stop at the University of Southern California's College Democrats meeting. The former Marine, who is considering a 2020 bid, sought to bill himself as an "outsider" in his pitch to a core group of Nevada voters: veterans. "I've always been an outsider," Moulton said, according to the Nevada Independent. "I've always been willing to take on the Washington establishment. That's been true in almost everything I've done, and I'm someone who doesn't have a long political history. But I am someone who believes in this country." His campaign spokesperson told the news outlet that his vote to allow federal dollars to fund oil and gas exploration studies in the eastern Gulf was about trying to "get off of our foreign reliance on resources in oil and gas that has caused so much foreign wars and American lives and troops and resources." But after speaking with voters on the campaign trail, the spokesperson said, O'Rourke "wouldn't cast the same vote today." The former Texas congressman has been crisscrossing early voting states, bringing the style of his unsuccessful 2018 Senate bid against Ted Cruz to the rest of the country. After an 843-mile drive through Iowa, O'Rourke returns to South Carolina on Friday for his second trip since announcing his candidacy, for a three-day drive through Charleston, Clemson, Denmark, Beaufort and other communities. "The national emergency in the United States today is that the American dream for millions of Americans is on life support," he began. He also took a swipe at Trump, without mentioning him by name: "Put the phone down, let's get to work." But the native Ohioan then turned his criticism inward, to his own party, suggesting that Democrats don't need a "savior" but someone who can "grind it." He also added that the party should "not be so hostile to the free enterprise system, not be hostile to business." 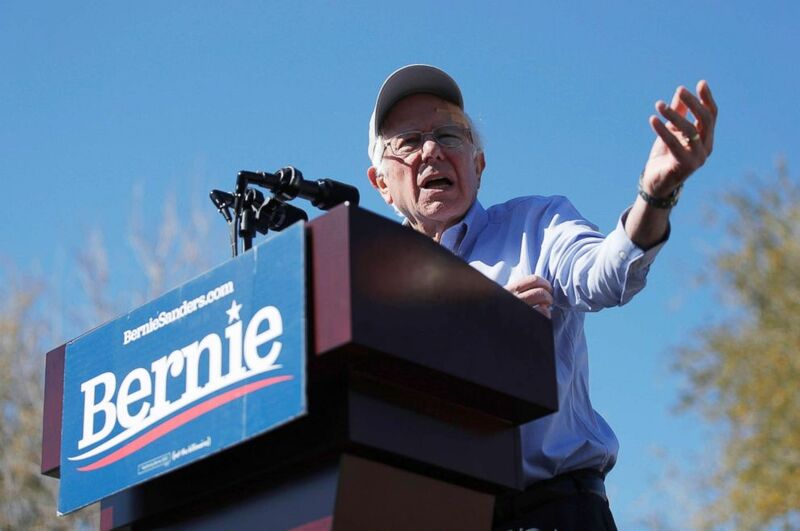 2020 Democratic presidential candidate Sen. Bernie Sanders speaks at a rally, March 16, 2019, in Henderson, Nev.
All eyes were on the two-time White House hopeful's tax returns this week. Sanders, a millionaire, told The New York Times he would release 10 years of tax returns by April 15. He refused to do so in 2016, which brought comparisons to President Trump. "Health care is a human right not a privilege," Sanders said. "Together, we are going to end the international embarrassment of the United States of America -- our great country being the only major nation on earth not to guarantee health care to all as a right. That is going to end." Schultz said he plans to make a decision over the summer on running, according to the Kansas City Star. During his trip through Kansas, before continuing on to Arizona and Utah, he told a crowd at a local community college that "the extreme ideology of the Republicans and the extreme ideology of the Democrats do not represent the vast majority of Americans who are at the center of this country, and we have to unleash them." The U.S. House member from California officially announced his candidacy on Monday on "The Late Show with Stephen Colbert." "It's official," Swalwell said. "Boy, did it feel good to say that." Swalwell also unveiled that gun control and student loan debt will be the centerpiece of his 2020 agenda on ABC's "Good Morning America" on Tuesday. "I'm telling folks, keep your rifles, keep your shotguns, keep your pistols, we just want the most dangerous weapons out of the hands of the most dangerous people," Swalwell said. "Most gun owners believe that." At his first event as a presidential candidate, Swalwell visited Broward County -- the site of the mass shooting at Marjory Stoneman Douglas High School that killed 17 students and teachers. "Throughout this campaign, there will be other issues that I talk about — health care, education and climate change," he said. "But my pledge to you tonight is that this issue comes first." 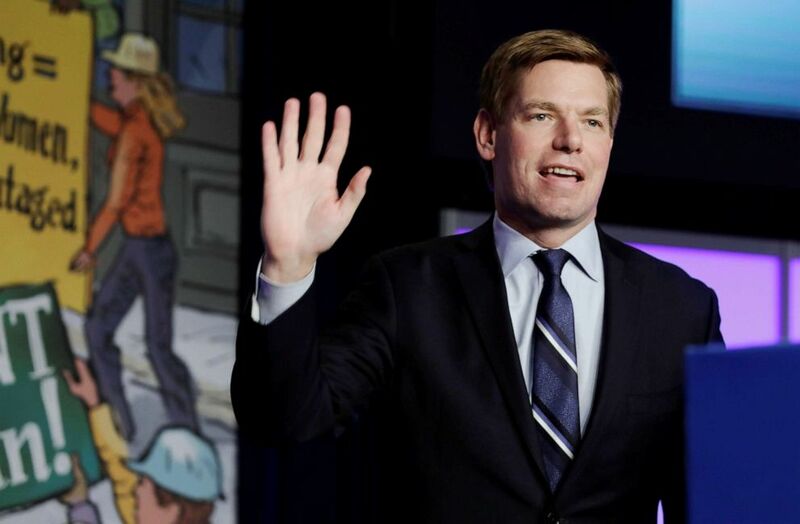 Democratic U.S. presidential candidate Rep. Eric Swalwell arrives to speak at the North America's Building Trades Unions 2019 legislative conference in Washington, April 10, 2019. While the Massachusetts senator bested two of her colleagues in the Senate -- outraising both Klobuchar and Booker by $1 million -- she still fell short of others like Sanders and Harris. "I've put out 11 years of my tax returns because no one should ever have to guess who their elected officials are working for. Doing this should be law," Warren said in a statement. Yang told ABC News's George Stephanopoulos on "This Week" that his cornerstone universal basic income proposal -- which would provide every U.S. adult with a $1,000 guaranteed monthly income -- will prepare the U.S. economy for the 21st century. "We have to solve the problems that got Donald Trump elected in 2016," Yang said. "And to me, the main driver of his victory was that we automated away 4 million manufacturing jobs in Michigan, Ohio, Pennsylvania, Wisconsin, the swing states he needed to win." Yang said he's running to prepare the country for a future in which new technologies could cause a third of the nation's jobs to disappear.